War-Time Clarifications: Who Is Our Enemy? | Fr. James V. Schall S.J. 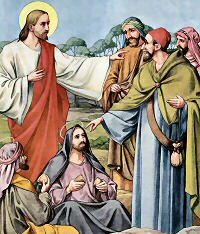 Jesus said to his disciples: To you who hear I say, love your enemies, do good to those who hate you, bless those who curse you, pray for those who mistreat you. To the person who strikes you on one cheek, offer the other one as well, and from the person who takes your cloak, do not withhold even your tunic. Give to everyone who asks of you, and from the one who takes what is yours do not demand it back. The first reading is taken from the First Book of Samuel (1 SM 26:2, 7-9, 12-13, 22-23). The prophet Samuel, on the instruction of God, anointed David to be the second king of Israel. Saul the first king, because he had displeased God, was to lose his kingship. His throne was to pass not to his son, but to David, an unknown stranger from the village of Bethlehem.This reading describes the event that occurred during Saul's search for David. The second reading is taken from St. Paul's First Epistle to the Corinthians (1 COR 15:45-49). In this Chapter of Paul's first letter to Corinthians the Apostle is speaking of the resurrection of all men from the dead. The Gospel is taken from St. Luke (LK 6:27-38). It would at first sight appear that the demands that Christ makes on our charity here are anything but easy. Loving one's enemies is asking a lot. Blessing them and praying for them might be all right for St. Francis but expecting it of us seems to be going very far. Asking for a blow on the second cheek while the first is still twinging with pain seems fit only for a martyr. Not to try to take tack what was stolen from us looks very foolish. Yet it was Christ who made all these demands. However, before we give up in despair, and decide that this type of Christianity is not for us, let us look a little more closely at the demands that are made. To love our enemy does not mean we must throw our arms about him every time we meet him (he would not let us anyway !). It means we must do all in our power to rid our minds of any hatred of him, and try to see the good that is in him. Not judging and condemning comes under this heading. Human sinful beings that we are, our faculty for seeing in our neighbor the real man as he is before God, is very limited and very prone to error. There are justly convicted robbers and murderers in our jails, in whom God can see a lot of goodness even now, and perhaps future citizens of heaven later on. Not demanding back what was unjustly taken from us does not mean that we may not have recourse to the legal or other means available to us for obtaining compensation in such cases. What it does forbid is personal (generally forceful) restoration of our rights and property. Another consoling point to bear in mind is that the vast majority of our fellowmen have no inclination to injure us in our person or our property and will never do so. If we feel we have a lot of enemies only waiting for the chance to pounce on us, we would do well to examine our own consciences very carefully and then look for the many good points there are in our neighbour's character. "An eye for an eye, a tooth for a tooth, life for life" was the practice amongst the Jews at the time of Christ and for centuries before (Ex. 21 :23-25). Christ sets up the "golden rule" of fraternal charity in place of this Law of Talon. Every man should truly love his neighbor for he is his brother. What is more, Christ's mission on earth has made him a son of God and an heir to heaven. Our chief interest in our neighbor must therefore be a spiritual interest. If he offends us, he offends God which is much more serious. Our charity should help him to seek God's forgiveness. That he should seek ours is of very minor importance in comparison with that. You would like your neighbour to help you to reach heaven. "You go and do likewise" to your neighbor, and you will both get there. "The sower went out to sow his seed . . . Now . . . the seed is the word of God" (Gospel). Every springtime God, as it were, rewrites the Book of Genesis and Creation. Appropriate to the coming spring, Jesus is now pictured as the Divine "Sower." He sows "seed" in the soil of our souls, covered with "rocks" of hardening pride, "thorns" of softening "pleasures!" The Epistle is a vivid picture, moving in quick action over Europe and Asia, but above all moving our souls to action as it describes the sacrifices of Paul, the "sower," sowing the "word of God," despite passions from within, persecutions from without.